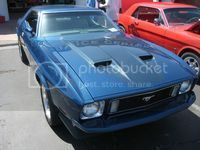 Just finished wrapping this Mustang in matte metallic blue with a satin black center hood, roof and spoiler. Bring you ride back from the dead in a few hours.............Great work, Do you have a price list for this job, and how much does a wrap for the front end of the mustang cost???? Wish that was available when I needed my Stang ANY color other that white (which it is).